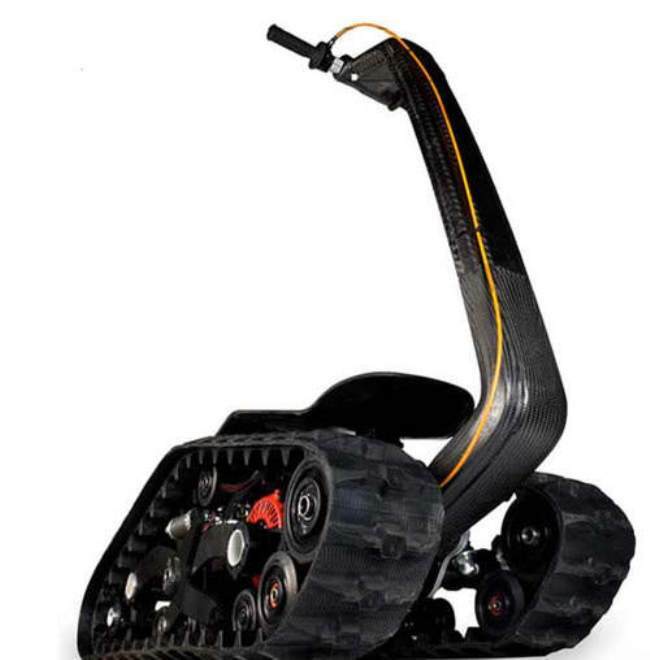 Trust us, calling this mechanized beast a “Segway tank” is the best description possible. The creation of inventor Ben Gulak, his skateboard-on-treads is being touted as the next evolutionary step in mechanized warfare. How? Judging by the awful photo shopped pics on the DTV Shredder site, soldiers are supposed to ride this baby and charge off to battle. Mr. Gulak and co. even showcased their pint-sized APC last month in a Detroit conference. For the skinny on this monster, we suggest you read on. Having gotten an eyeful of its promo videos we found that strangely enough, for a vehicle so attractive a specs list is unavailable. What you’re served on the homepage instead are lots of vids showing how the DTV works in any kind of surface. Still, deep inside you hear that inner kid is squealing with delight. You want one bad, even if the worst terrain you’ll ride it on is a pristine backyard. Judging by the promotional literature, its uses are broad. Go to war with it, lug the wounded to safety, even convert it into a miniaturized RC tank. That last bit is a little too Terminator for comfort. We know we’ve been saying this a lot lately, but somewhere out there SKyNet is laughing its evil laugh.